Anglim’s Western Metal Works is more than a welding shop. 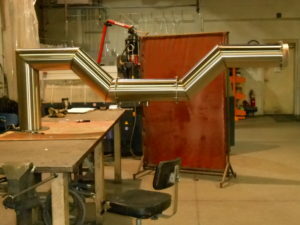 We’re a full-service metalworking company with the tools to handle a wide range of metal fabrication and welding projects – from metal art to structural fabrication and much more. We complete each job with care and precision to ensure high-quality results that will be long-lasting, every job, every time. Our team is experienced in a range of techniques and materials. We can provide steel welding and fabrication for all types and thicknesses of steel and steel alloys. We can also handle all aspects of cutting and shaping to achieve precise results – whether you need a machine component made to exact specifications or are requesting a sign or piece of metal art with an intricate design. machinery for sheet forming, shearing, and other aspects of the fabrication process. You can look at our gallery to see a range of the projects we have completed for our private and commercial clients, or contact us today for a custom quote on your own steel fabrication project! Call 505.822.9170 to learn more about our welding and fabrication services.